On the Small Boat Harbor in Downtown Valdez! 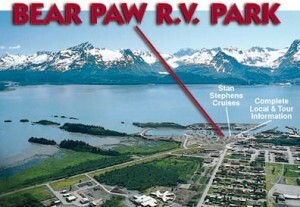 We have two RV parks in Valdez for your convenience, Bear Paw RV Park and Bear Paw RV Park II, an adult only park. Both of our RV parks are located in Downtown Valdez conveniently close to Boat Tours, Restaurants, and Gift Shops! Valdez, Alaska is one of the most beautiful areas in the world! There are 5 spectacular glaciers in the Valdez area that can be accessed by cruising, flying, walking or driving. You’ll find us on Prince William Sound by the Small Boat Harbor, the departure point for all cruises and fishing charters. Valdez offers all species of salmon and some of the most accessible big halibut in Alaska. There is lots to do in Valdez!